One of the perks of giving tours of the Microsoft Home was receiving small hostess gifts from visitors. These gifts usually had little monetary value although held significance for the giver; sometimes a cultural icon, an example of art and engineering, or symbol of friendship. I would re-gift most things. I always got a kick out of passing things onto my colleague Jim. I would stand in front of his office with something like a packaged set of character key rings for the 2010 Olympics, while spewing that plastic crap like this would be the end of us all… when he would leap from his chair and squeal with delight saying how cool they were. The gifts also made for great contributions to my friends yearly white elephant party. Year after year I would bring a small collection and people would fight over them; a book of stamps, cloisonné necklace, a silk scarf… to add my mark, each re-gifted item was accompanied by a riddle or poem describing the wrapped gift and the original giver. It seemed right to include some of the gifts history. The gifts I valued the most were ones I developed personal meaning for. 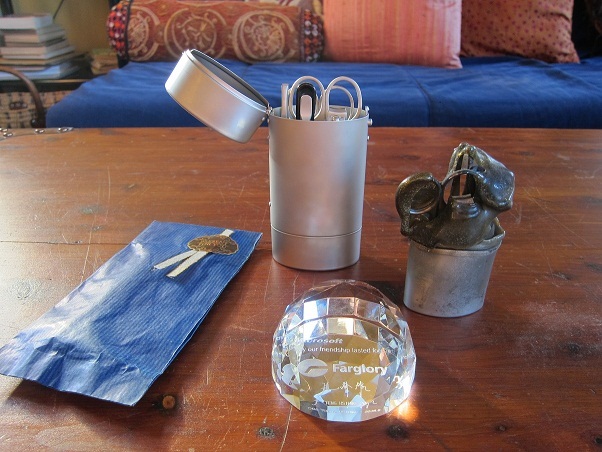 Among them are a paperweight, nail kit, and a blue bag. Each now represents a small story. The stories have nothing to do with the givers intention, but relate to my personal meaning for them. That’s the thing about giving gifts once they are given they often take on new meaning. I kept this as a reminder of the power of communication and how positive intent is often lost in translation. It was clear that they wanted this to be a symbol of friendship. However because the statement was awkward, it amplified the cultural gap of an unshared native language. I identified with this gap as I often struggled with communicating my intent to the world of corporate business software. Preservation of identity and culture is important; I hope that Farglory doesn’t feel they need to be more like us. The nail kits represent before and after 90 seconds of exposure to fire. The new kit was a gift from ING, a partner of Microsoft, and frankly I can’t remember the specifics of this particular visit although the gift struck a chord. A few months prior to ING’s visit we received a call in the middle of the night. My son Sam was on the other end. Sam- “Mom, I’m in a bit of a predicament.” Me- “Son, its 2:38 am what the @&#$ is going on.” Sam-“Our house burned down”. 4 minutes later I was at the scene a few blocks from my house where I found Sam, Jordan, and Bennett on the street in their underwear with firemen attending to the remaining structure. The fire had taken half the house. Only 1 smoke detector was working in the house, it was upstairs outside Jordan’s room and luckily he heard it. The next day as we picked through the wreckage looking to see what could be salvaged. I found a nail kit in what used to be the bathroom and decided to keep it as a souvenir. The plastic top had melted onto itself creating a strange kind of mummification. The bathroom shared a wall with Sam’s’ room. Sam was sleeping when the fire started and his room was the next to go. One of the firemen told me it takes 90 seconds to destroy each room once a fire is going. These 2 kits now sit as a pair and a reminder of the impermanence of life, before and after 90 seconds. We often received gifts that were wrapped. The anticipation and promise of each wrapped gift made them fun to open for a while, but being continually disappointed gets boring. When I received the blue bag I decided not to open it. The idea of what could be in the bag was likely much more interesting than the gift itself. For years the bag was attached my office door with a paper clip. When people would ask what was in the bag I could honestly say I have no idea. This made for interesting conversation as well as pushed some people’s buttons. At the end of a contract, a designer who was leaving asked if she could look inside the bag if she promised not to tell me its contents. Her expression was flat when she let me know she had looked. It was a telling look justifying my decision to keep the gift secret. I have had the blue bag now for eight years and have never looked inside. Someday I will burn it as an offering for honoring the unknown. Long live hostess gifts and re-gifting.